Like a lot of people the news of Eric Caidin’s sudden death left me deeply stunned and extremely sad. Although I only really got to know him the last few years, that time was a fun eye-opening experience. 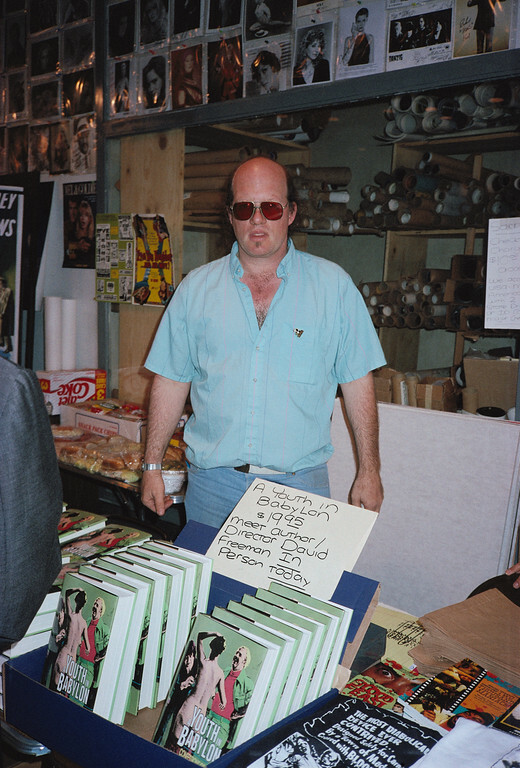 It seemed like every convention, retro-screening and other old time movie function I ever went to he was there, but we never became friends until my business partner John and I started setting up our memorabilia table next to his at the Hollywood Collector’s show. At the slow times of the convention (and believe me they were many), Eric would recount stories by the hour of his crazy past that were unforgettably entertaining. 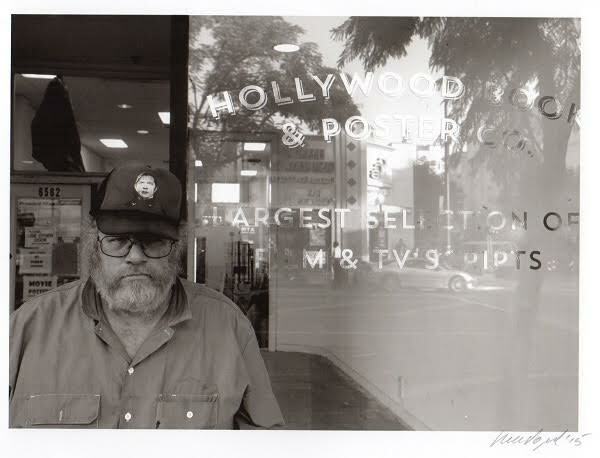 His bookstore was in Hollywood for decades and he had been selling at the movie, rock’n roll and sci-fi conventions since the early 70’s, so no matter what aspect of entertainment you were talking about he had a story about someone who had come into his store, he had met at a convention or he had been out drinking with. Not only were his tales about Hollywood, stories of his own life could fill volumes. As a drug induced rebellious teenager growing up near the Sunset Strip in the late sixties he got to see and hang out with all the giants of rock. And from there his mind blowing adventures just kept getting better. 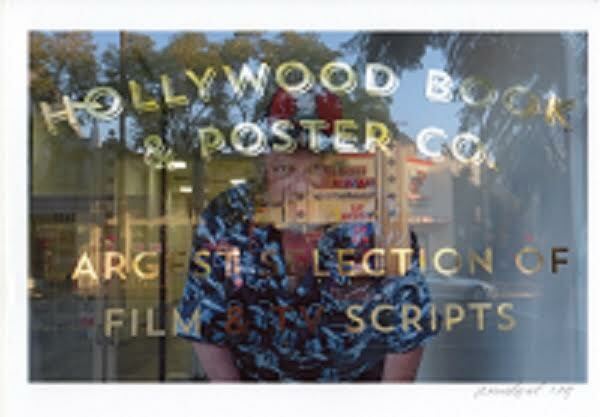 Starting from running a packed movie poster shop on Hollywood Boulevard, his love of gambling and the constant obsession with watching grindhouse flicks and Lucha Libre wrestling at run down midnight movie theatres, he was like a no one else I had ever met. The last show we did together, Eric was walking hunched over and looked very depressed. 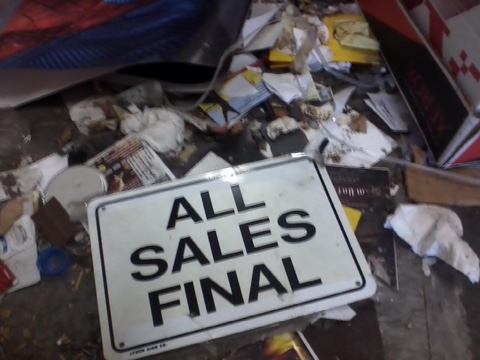 He told me the lease on the store had been up and the landlord had just raised the rent to an exorbitant amount. To make stressful matters worse, there was no where else in the area that was even close to affordable because of Hollywood’s “urban renewal” trend. Most of the other small bookstores and memorabilia shops on the boulevard had suffered the same plight by being forced out by high rents after their leases had expired. A trendy Starbucks, a crappy tourist T-shirt trap or a hipster night club seems to be the wave of the future on the boulevard. So Eric had to move out of Hollywood. His complicated plan was to have his legendary Hollywood Book and Poster shop relocate to Burbank. However, the space he was planning on making his new home was not available yet. Now every item in the shop had to be moved into a temporary warehouse in the valley until the permanent store front opened up. 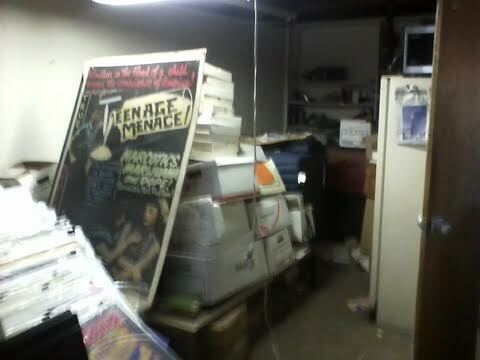 That meant around seventy five thousand film and television scripts, fifty thousand vintage movie posters, a hundred thousand movie photo stills and countless magazines and other memorabilia of the genre had to be boxed up, labeled and hauled over there. A major up-rooting since the store had been in Tinsel Town for almost forty three years. At this point, Eric was running low on funds. In order keep his two loyal long time employees ( and I mean long time, I think they had both worked for him for over 30 something years) he wanted the bookstore running as an internet mail order business until the next upheaval would begin. John and I spent a couple of days volunteering with Eric’s monumental transplant and then I was able to take a couple more days off of work and help get the final things out of the store, at which point he had dangerously run over his time to vacate with the landlord. Quite a few personal items were still in the shop like his collection of Mexican wrestling and early exploitation movie posters. That vast and unique assortment was the best I’ve ever seen. 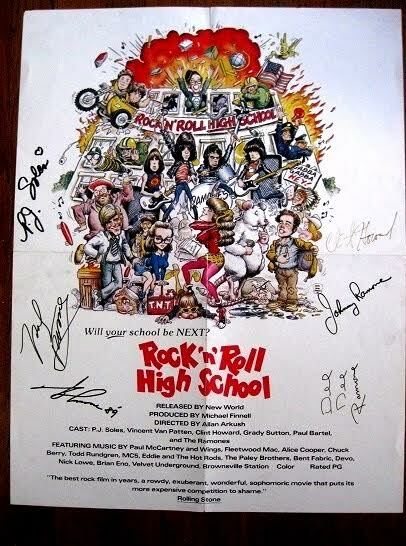 I even found a “Rock ‘N’ Roll High School” one sheet signed by all of the Ramones which I bought from him. And in typical Eric fashion then he started to relate to me how the Ramones were his pals and that not only did they hang out in the shop but at one time invited him as a personal guest along on their tour. I never heard the full story, I just figured I would get the real crazy details on that adventure during the slow points at the next Hollywood Collector’s Show. We always think we have tomorrow. A lot of the stuff I helped to haul didn’t go into the warehouse, it ended up being stored in Eric’s empty guest house, which we filled up in no time. His previous tenet was a former employee named Jerry who was tragically killed one night a couple of years before in a brawl at the Frolic Room bar. 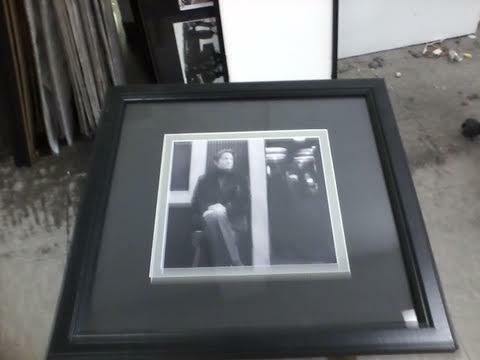 Appropriately one of the last items to be removed from Hollywood Book and Poster was a portrait of Jerry. The last few trips with Eric in the rental truck we moved loads of posters and assorted fixtures to his packed homestead. There were framed posters and photos signed by Spielberg, Landis, Carpenter and many more that had hung in the store for years and now were going to his house. While we were driving, I got to hear more great epics about his life particularly his love-hate relationship with gambling. He told me about one of the many times in his younger years when the family went to Las Vegas. His father, who was a big entertainment lawyer, had arranged to meet Elvis backstage after a show. Eric angrily told me that he had skipped the one-time-only invite because he didn’t want to end his winning streak at the tables. After the lament, Eric wanted to take me to lunch. It was his favorite dining spot on Hollywood Boulevard and he proclaimed they had the best all- you-can-eat specials in town. It’s called the Las Vegas Buffet. As we moved out our final load and Eric locked the door for the last time, he wasn’t depressed anymore. Although the future was uncertain, he was excited about the next adventure……. This entry was posted in Books, Celebrities, Events, Hollywood People and tagged B-Movies, Celebrities, Eric Caidin, film noir, gambling, Hollywood, Hollywood Book and Poster, old Hollywood, Wrestling. Bookmark the permalink.